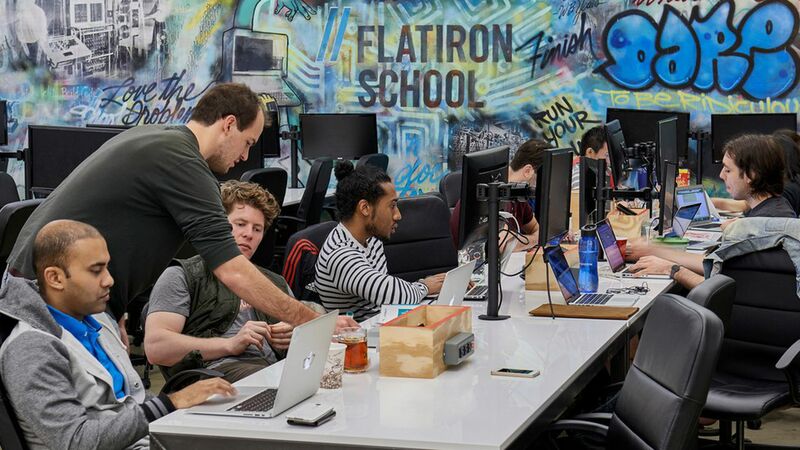 WeWork, the office leasing giant, has acquired the New York-based Flatiron School, a private coding academy, in a gamble on 15-week, $15,000 vocational education as opposed to far more expensive four-year college degrees. The companies did not disclose the precise value of the cash-and-stock deal. At $20 billion, WeWork is tied for the sixth most-valuable startup in the world. Why it matters: At a time many experts and politicians are questioning the assumption that college is for everyone, the deal bets on a fashionable form of vocational education — coding — as a route to well-paying software jobs. The plans are to expand Flatiron from its single location in New York's financial district into most of WeWork's approximately 170 offices, which would further test the growing idea of bypassing college, at least in the U.S. tech world. The deal fits WeWork's cultural play: WeWork rents out exquisitely designed and operated office spaces with the feel of boutique hotels. Adam Enbar, co-founder of Flatiron, said the deal, which was signed Oct. 11 but announced only today, aligns with a cultural shift to which WeWork is marketing. "More than prior generations, people want community at work," Enbar told Axios. "When you imagine education in a space, it starts to make sense. One of the most powerful forms of community is learning." Six days after the agreement, Flatiron signed a settlement with the New York Attorney General in which it agreed to more clearly disclose its hiring and salary rates. Almost all graduates find jobs within six months, but they range from full-time positions to internships. The settlement included a $375,000 payment. The school appears now to be in full compliance. Artie Minson, WeWork's CFO, said the deal was in the works for nine months. Enbar said that many on-line schools were failing to teach effectively because most students need to be with other students while they learn, and not just learning content at home alone. That is why the physical school is important. "We forget about that," he said. "Something is lost when you remove a physical community."